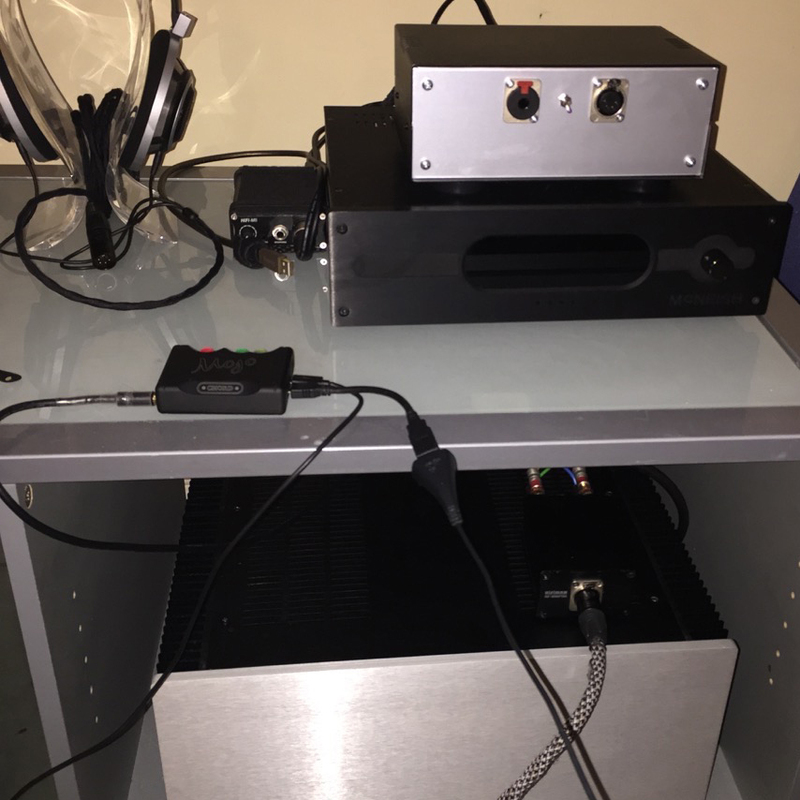 As a DIY’er / Modder and someone who builds high quality amps, the only thing I am lacking is a good quality desktop DAC. When the opportunity arose to test the Mojo I was keen to hear it with my system. 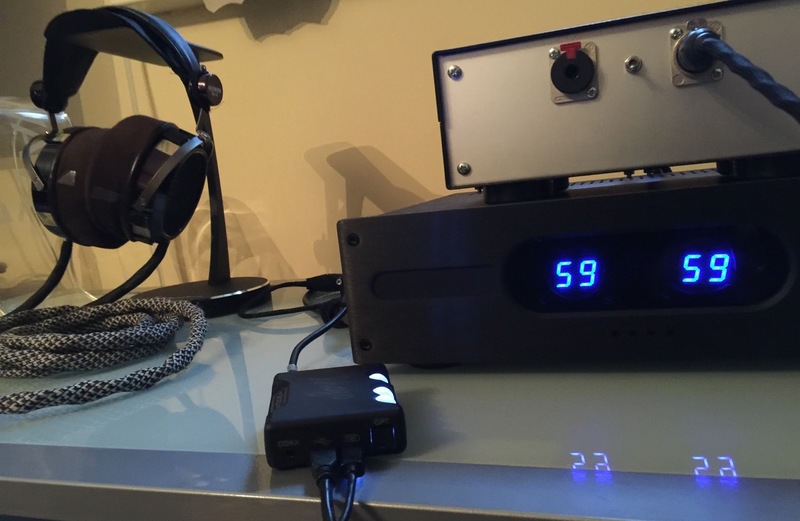 No, it’s not a desktop DAC but with a good quality DAC, it still can make a difference to my current set-up. 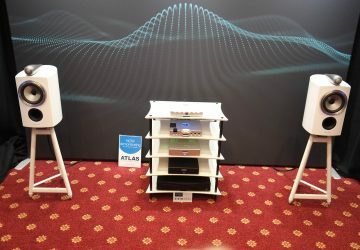 At present, the DAC that I’m using is my Centrence Hifi-M8, which sounds really good on my system but I wanted to see how much of an improvement I could get with the Mojo. I have tested the Mojo in a variety of ways. My first listen to it was directly with the iPhone 6 Plus, and used the camera kit for the iPhone 6 Plus and the software VOX and Onkyo HF Player for the original tests. In addition to this, I tried it with a direct connection to my Mac with USB with Amarra, and the Mac from its optical out. Finally, I tried optical from my media player to watch a film. As a portable device you have to use it in a portable set up. Connecting via the iPhone 6 Plus is a perfect way of doing it because you are able to listen to music in a high quality manner and with ease of use. It’s exactly what the Mojo is made for. As I quite often use my headphones for watching films it was important to me to test the realistic sound quality of a film via my media player (Med8er 1000 x3d) via optical. I used the Mojo with my Beyerdynamic DT 1350’s, Sennheiser HD 800, and did a brief test with my Hifiman HE-6’s. The HE-6’s connected was unpractical because it requires much more power than the Mojo could deliver. This was to be expected, but I thought I’d give it a try. For my first comparison I plugged the Mojo in my iPhone 6 Plus via VOX player and listened to the HD Tracks version of the Thriller album, the track PYT in particular. I was instantly amazed by the clarity, transparency, natural sound and bass detail coming from my DT 1350 headphones. After listening to the Mojo, I immediately powered my Hifi-M8 and did a quick comparison with the same track and setup. Even though the DT 1350 is only my portable headphone for my traveling, I was definitely able to hear differences between the Mojo and Centrence Hifi-M8 with my first testing track. 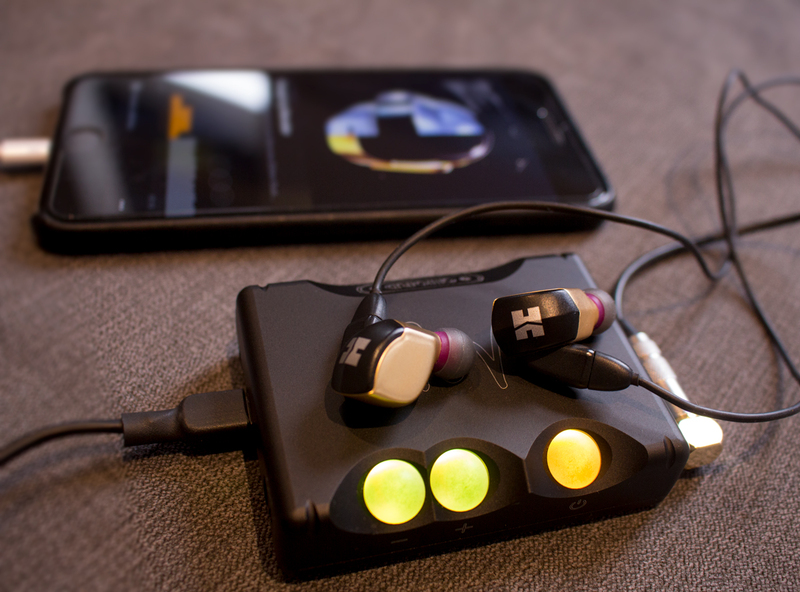 The Hifi-M8 is known for driving a large range of headphones, from IEM’s to full size demanding headphones. Since the DT 1350’s are pretty easy to drive the test would not be for power but for clarity and DAC quality. 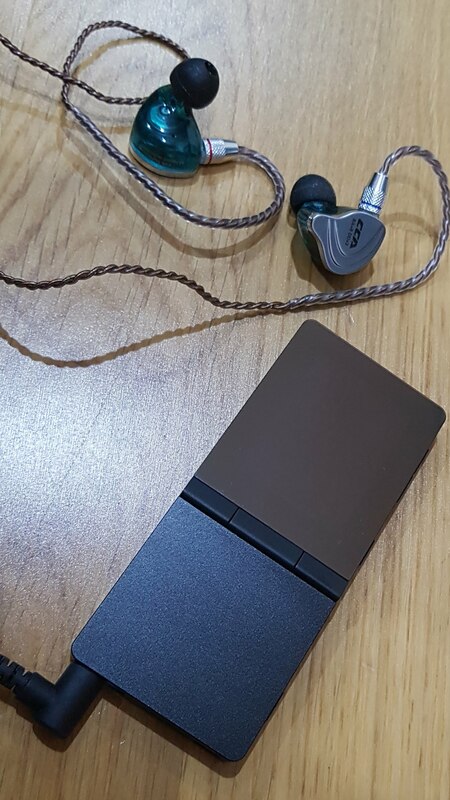 Upon going back and forth between both the Mojo and the Hifi-M8, I definitely noticed a big improvement with the Mojo in terms of DAC quality. I heard the graininess of the Hifi-M8 DAC wise. It seemed a lot more natural sounding with the Mojo, and the bass quality and detail was quite a bit better. After discovering the quality in the bass difference I wanted to do another test track which I use for bass quality comparisons. One such track is Wesley’s theory by Kendrick Lamar, which is on the ‘To Pimp A Butterfly’ album. This completely confirmed the difference in quality. After being so impressed with the combination with my DT-1350’s I wanted to test it with a more demanding headphone. My next choice was my HD 800’s, this time connecting the Mojo to my Mac using Amarra. One of the first tracks I decided to listen to was Gregory Porter ‘No love dying’ from his Liquid Spirit album (HD Tracks. The detail was really good and I heard the refinement of the DAC quality, but one of my first impression was that it didn’t drive the HD 800s as good as a desktop rig. Compared to my two chassis desktop amp which I built myself there is a big difference in power authority and dynamics. After that I knew it would not drive my HE-6s (well I did know before but I thought I’d give it a shot. As to be expected the Mojo did not do a good job with my HE-6’s. 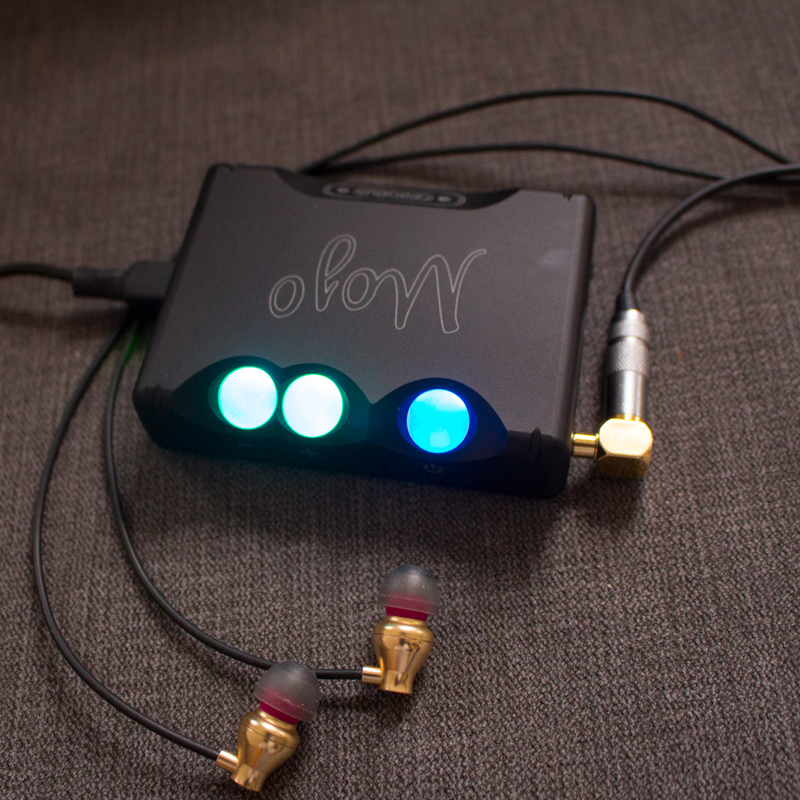 The next test was to connect my Mojo directly to my amplifier, which could drive my Hifiman HE-6 headphones. 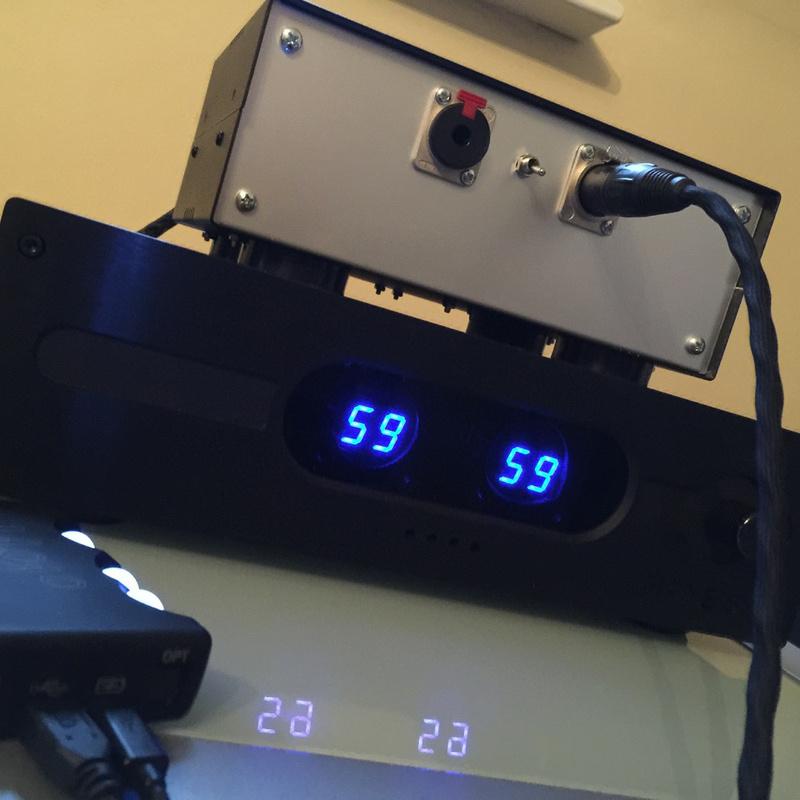 The first amp I tested it with was my latest build (First Watt F6). I played a Chesky Records recording – Alexis Cole’s “Ain’t we got fun” from the Kiss In The Dark album. The next track was Chet Baker’s ‘Travelling light’ from his Bakers Holiday album (HD Tracks). For both tracks it felt like I was in a smoky jazz club with the singer singing directly at me and the band was surrounding me. I just closed my eyes and sunk into the music. The voice clarity was amazing. The instruments, voice separation was really natural sounding with air between each notes. The vocals stood out with great staging. This was an amazing combination. The dynamics, clarity, and transparency were all top notch. 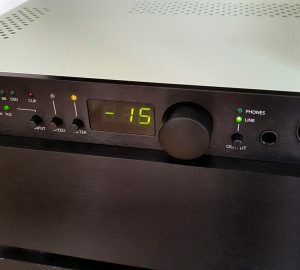 As the First Watt F6 is power amp there was no volume control or pre-amp in between so I was able to listen to the Mojo in its most pure fashion. The volume switches on the Mojo are a nice feature, as you are able to adjust and control in either small increments or hold the button for a smooth volume transition. The coloured light indication is also a handy feature. I was interested to test the Mojo on a different amp in line out mode using my own built passive pre amp (tortugo audio passive pre amp) The headphone amp itself is a DIY built based on a Nelson Pass Design. I used my HD 800 and the DSD track “Oblivion” from trumpet player Andre Heuvelman’s album “After Silence” (DSD/352). Boy did this sound great. Every detail from the subtle button flicking and breathing to the naturalness of the music. Also the imaging and soundstage surrounded me in every way. The album was originally mixed using the HD 800 so I definitely wanted to give this set up a try. I have never heard this particular album sound that good. Obviously, my desktop amp helped with this as I feel the Mojo does not drive the HD 800’s to its full potential. My final test was to watch a film. The Mojo showed great functionality and I found it very handy. If you want to listen to a film intimately whether it’s on the move with your phone/laptop or at home chilling. I tested it on a few worthwhile scenes of World War Z. The Mojo gave a natural feel to the voices and sounded impactful and dynamic when called for on action sequences. When using it with the HD 800 I decided to connect the Mojo to my desktop amp which gave overall better quality with all the movie sub bass I needed. Listening to the Mojo at loud levels the HD 800 could sound a bit harsh so that’s why I needed a different amp. For less picky headphones I feel it would be a great solution. How does the two portable amps comparison fare? 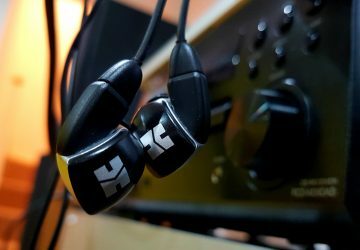 My Hifi-M8 is more powerful and could drive a larger range of different type of headphones, even the HE-6’s to a par standard, but it can’t fully drive the HE-6s as it requires more power. That said, it does a much better job than the Mojo. 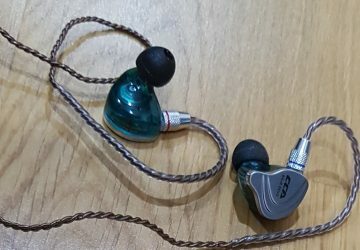 With the HD 800’s I feel the Hifi-M8 powers the HD 800 better but lacks the refinement in the DAC quality. The Mojo has the win when it comes to the sound quality of its amp / DAC, ease of use, functions, digital inputs, build quality and size. 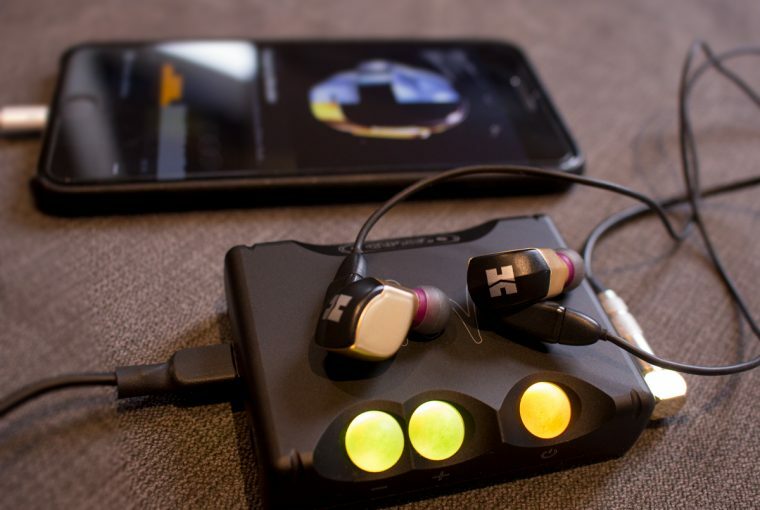 The Hifi-M8 has its own nice functions like the impedance switches, tone adjusting switches, a variety of headphone outputs. Another great feature is the native connection to Apple devices without having to use the Apple Camera Connection Kit. You can also charge your Hifi-M8 and Apple device at the same time. 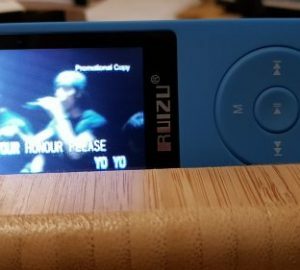 The Camera Connection Kit has its benefits when playing HD music and DSDs but that wouldn’t help if you are using an old iPod, also you’re not able to charge. Having the Apple device version of the Hifi-M8, I am not able to connect optical so this would prohibit me from connecting my media player or anything with an optical port. The Mojo is easy to use – it would automatically detect your digital source without the need to press a button. It also allows you to know exactly what sample rate you’re using via the visible coloured lights. 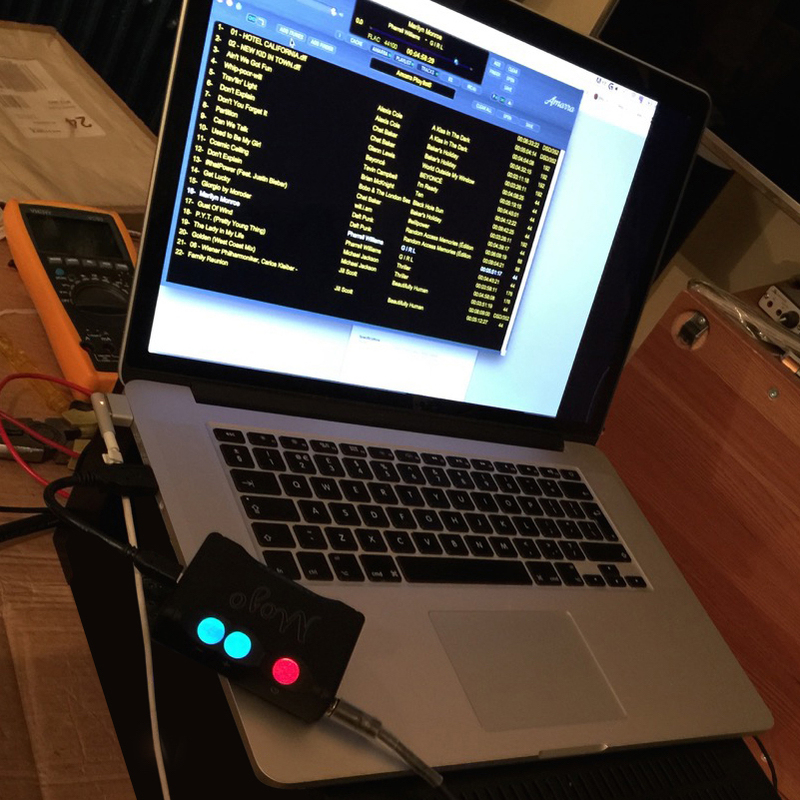 9.1Is the Mojo a desktop killer DAC? I would say no, but it definitely has a top DAC in it and as a portable system you get great value for the price. The simplicity and functionality is great. A user could just plug it in and have great quality music on the go, no matter what source they use with it.